After some cutscenes, start by walking up to Roxas' crew by using the stick, and after that walk up to the lady at the accessory shop. Lock on ( ) to the cat, and some cutscenes will ensue. You are then presented with three weapons -- each of which you can use the appropriate Reaction Command ( ) to select, and each of which gives Roxas a stat boost. The normal struggle bat prioritizes offense, rewarding Roxas with an extra attack point; the guard bat has the added feature of a hand guard, prioritizing protection and rewarding Roxas with an extra point for defense; and lastly, the staff fittingly provides Roxas with an extra point in magic. After selecting a weapon, the tutorial will continue with the basics of battle. For the first encounter, do as instructed and attack him continuously. This sequence will then segue into the real battle, in which case you can freely attack him until he is forced to face defeat, and he is also free to attack you. From time to time, he'll do a double-strike attack, but this is easily dodged and doesn't deal a great amount of damage. His only other attack has him jumping up into the air and, as a cue, yelling "isn't this romantic!" before striking. This can also easily be dodged. Simply lock on to keep track of his movements and perform simple combos to defeat him, denying him the opening to counterattack. After the short fight, follow the Nobody to The Old Mansion, and perform the Reaction Command ("Capture") when Roxas is close enough to interact with it. A small cutscene ensues. This battle is pointless, as Roxas' attacks prove completely ineffective against the low-ranking Nobody. Instead, use this time to get a feel for using Reaction Commands in battle with the Reversal option. This disorientates the creature, giving Roxas the opportunity to attack freely. While it doesn't serve much purpose here, it will prove useful in the future. For now, keep randomly attacking or just running away. Eventually (after a certain period of time, or when Roxas loses 25% of his HP), a cutscene will show, and Roxas will gain possession of the Kingdom Key. Use this to finish off the Dusk, and remember to use the Reversal to avoid the Dusk's attacks and confuse it, allowing you to pull off a combo easily. As the Dusk is at the very bottom of the Nobody hierarchy, this battle should be finished without any trouble. 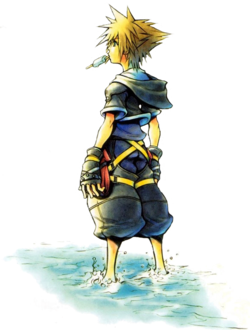 Unfortunately, Roxas loses the Keyblade in the next cutscene, but the day concludes without much more incident and Roxas goes to bed, triggering the regular nightmares: flashbacks of the events of the first Kingdom Hearts, featuring a boy named Sora. You'll start off in The Usual Spot -- take note that you can finally save. Go over to the save point and press to save. PlayStation 2 players stingy with their data usage should take note that a typical KHII save takes 87KB, which is small enough to merit a save per world on a blank/dedicated KH2 memory card in case one wishes to revisit any story aspects. To the guy walking around the left side of the street. To the bird flying in circles. You should see it a couple seconds after you deliver the first letter. To the person hanging around the job listings board. To another bird. Grind on the rail with RC to get to it, then press RC again while in the air. To the lady hanging around to the right of the bird you just delivered a letter to. Attack the cart (uphill, that is) into the garage by using combos. If you manage to get a full combo off, then the cart will leap up into the air. This is your opportunity to do an air combo, and push the cart a massive distance. To help make this even easier, lock onto the cart, and try and stay behind it at all times, so that it doesn't severely swerve to the left or right. Juggle the ball with your weapon of choice, with whatever combos you can throw at it. The game will keep track of your high score. You have 5 attempts, and the attempt with the highest score will be the one that gets you the Munny. A good tip is to lock onto the ball as soon as possible, so that you can't lose sight of it. Find spots on the walls to paste posters using reaction commands. The easiest route is shown in the video to the right. Kill the bees with your weapon of choice. Remember to lock on, of course, as soon as you have destroyed one of the drones. Not much strategy is required here. Attack the junk to clear it from the field. You can also hit junk into each other for a more effective cleaning. Note that there is no time limit to worry about, and bumping against a box doesn't count as a swing. Therefore, you can gently move the boxes next to each other, and then hit a box to destroy all of them at once, thus increasing the amount of Munny you can receive. You need only do one of the six tasks, and earn at least 50 Munny, but the game gives AP bonuses for acquiring enough munny - 1 AP for 800 Munny in total (650 earned), and 2 AP for approximately 1200 Munny in total (1,050 earned). You'll know you've reached it when the game takes you to the next cutscene automatically (at 2,000 Munny earned). However, if you just want to carry on the story when you want to, then talk to Hayner in the Station Plaza. You'll acquire the Munny Pouch for your efforts. However, in the cutscene, it's stolen from you by a mysterious person, and the day ends with yet more flashbacks to the first game. Meet your friends. After some odd cutscenes, prepare to defend yourself against a Dusk. Do what you did on Day One (attack it ineffectively), and a cutscene will soon follow. When you have control again, use the reaction command to select between the sword, shield, and staff, which stand for Attack, Defense, and Magic respectively. If you press to switch to First-Person Mode and look around, you can see the Dusks waiting ahead. For more information about the abilities you'll learn from each weapon at what level, check out the abilities page. Once you've made the very important choice, you'll acquire the Keyblade, and then the Dusks will attack you. It's exactly the same as before...except now there's three of them. There's nothing to worry about, however, just use "Reversal" and you'll get free attacks. You'll get the Aerial Recovery ability for your efforts. A door appears, along with another save point. Look around, and you'll find a chest, which happens to contain a Potion. Take the time to equip your items and your new ability if you haven't done so already ( button to access the menu). Then, go up the stairs and fight yet more Dusks. Go up some more stairs to the door. This is a good opportunity to get Roxas ready for the battle ahead, as this is a very good time to gain a few levels (up to a maximum of 4 for the minute, at least for the Scan ability). The Dusks respawn every time you leave the area, and they give out decent experience for this point of the game. An advantage such as this may prove useful for Proud or Critical, but of course, it isn't necessary. Make sure not to use your Potions just yet, as they should be saved for the boss coming up ahead. Instead, use the save point found in the Station of Serenity, which fully heals you to your maximum HP. Once you feel you're ready, heal, save, and open the door to the Station of Awakening to face the game's first real boss. The fight will start with Roxas paralyzed in the air. Begin by performing the reaction command Key Counter when prompted, and Roxas will dodge the Twilight Thorn's attack and perform a counterattack of his own. The Nobody will then throw Roxas into the air, at which point another well-timed reaction command will have Roxas perform Lunarsault, again dodging the Nobody's attack with a flip and another counterattack. This will have done a considerable amount of damage to the boss already, but the quick-time events aren't over yet. The Twilight Thorn disappears into the darkness, leaving Roxas alone for a few seconds only to topple the platform and send Roxas falling into a newly-summoned, massive ball of energy. Successfully perform the reaction command and Roxas will throw his Keyblade into the mass, causing it to destruct early. This combination of attacks will cause the Twilight Thorn to slam back onto the platform, stunning it for a short period and allowing you to attack its head (the creature's only weak point). Lock on and perform as many combos as possible until the Twilight Thorn wakes up, beginning the main phase of its attacks. Avoid the white thorns that it sends Roxas' way by performing the Reversal reaction command. Performing this reaction command enough will allow Roxas to get high enough to hit its head. It will eventually counter with a sweeping attack, which can be dodged by jumping. Another type of thorn attack has it hanging upside down with its head in reach of Roxas' attacks, but these thorns will come at a much quicker pace and stunning it will be impossible, resulting in a pattern of constant reaction commands mixed with attacks. You will also occasionally have to contend with another type of low-ranking Nobody, Creepers. Killing them off isn't necessary, as they are weak and slow enough so that they don't have much affect on the battle, but if Roxas is in need of HP, they are easily terminated and drop a considerable amount. Eventually, the fight will repeat itself with the beginning reaction commands, resulting in Roxas winning (or at least coming close to winning) the fight. Make sure to use a Potion if needed. If you have Scan available and equipped, you can see how much damage you've done to the boss already, but again, this isn't necessary, as even on the hardest difficulty, with increased damage dealt and a few Potions, this fight shouldn't pose too much of a problem. Roxas' maximum HP will increase and he will obtain the Reflect Guard ability for clearing the battle. Afterwards, numerous cutscenes will take you to Day Four. Today, you are forced into doing the Struggle Tournament. Before that, however, you have the chance to do the mini-games that you did on Day Two. This can be used to earn some extra Munny for any Potions you might want from the Item Shop. If you wish, you can also fight Seifer again in the Back Alley. He definitely shouldn't be too difficult to defeat, and he'll give out 13 experience each time. To fight him again, simply leave the area and re-enter. Once you have finished doing anything extra, talk to the man next to the blackboard, and listen to the rules. Afterwards, you'll fight against Hayner. The aim of the following battles is to try and get more points than your opponent within the 1 minute time limit. The opponent's orbs will drop every time you hit the opponent, and Roxas must simply walk toward them to collect them. With that said, the battle against Hayner should be very easy. All he has is a simple lunge attack, and basic ground and air combos - nothing fancy. After you beat Hayner, you'll have to fight Vivi. He has wide-reaching attacks when his club glows white and grows massive. His other attacks are fairly fast, but predictable to see coming by the way he stands. Once you beat Vivi, a cutscene will occur, and you'll have to fight three Dusks. You should be used to fighting them by now, so with a healthy use of the Reversal reaction command, there shouldn't be any problem. Make sure to conserve your health, as afterwards, another cutscene will occur, and you'll have to fight Axel. Axel fights using his chakrams and the element of fire. He can set his chakrams alight and slash them at you for high damage (especially in Proud and Critical). Surprisingly, he doesn't have a large range, so if you jump back when you see him start an attack, you won't be hit. As the battle goes in, you'll see him crouch from exhaustion; wait rather than attacking, as this is a sign that he is preparing to unleash an even more powerful attack. Guarding will not stun him as it would normal bosses, so Roxas will need to obtain his opening to attack by dodging. Jump over his attacks and perform aerial combos for easy damage, then walk away before Axel can counterattack and repeat the process. This strategy is particularly vital on Critical (where guarding/reflecting attacks is an otherwise encouraged battle tactic), as Axel does a great amount of damage relative to Roxas' HP and can only be stunned by combos. Use any Potions you have as required. You get nothing for defeating him, and after yet another cutscene, you'll have to fight Setzer in the Struggle Tounament. The majority of the time, he will pause to speak, making him one of the easier Struggle opponents (with his only real asset being his short glide through the air that provides range for his attacks and makes for easy orb collecting). You can receive two prizes from him, depending on whether you win or lose. For winning, you receive the Champion Belt (+20% resistance to Fire, Blizzard and Thunder each). For losing, you'll only receive a Medal (+ 1 Strength). Either way, you'll get the Struggle Trophy, which will be promptly lost during the cutscene. Today, you have to find the "Seven Wonders of Twilight Town". To do this, head over to the Central Station, and take the train to Sunset Terrace. In the following cutscene, the first wonder will be debunked, leaving only four to solve. Before doing so, take time to collect some treasures scattered about the area. First, jump on top of the southern tram by using the reaction command twice. A chest containing an Ability Ring will be on the roof of a building. For a Potion, drop down to the nearby tree from the last chest, and for another Potion, head toward the western exit, near the path leading to Sunset Hill. Lastly, for a Hi-Potion go down the steps from the last treasure, and it will be straight ahead. The following wonders can be done in any order. If at any time you wish to see which wonders remain and where they are located, speak to Pence, and he will bring up a map. One of the wonders is in an alley near Hayner. At the end of the alley, press to investigate and start the event. The aim of this wonder is to dodge the balls that come out of the wall. Use the reaction command when you approach the wall to clear the event. If you get hit by a ball, you will be propelled backwards a large distance, but Roxas' HP will remain unaffected. Another wonder is in the southwest corner of the map (where the waterfall is). After pressing the relevant button, a shadow doppelganger will appear. The fight is simple enough, as the doppelganger has the same moveset as Roxas does, but moves and reacts much slower. Therefore, it should be easily possible to pull off a combo, step backwards whilst it does its combo, then pull off another combo. Defeat it to clear the event and supposedly dispel the wonder. The third wonder is accessible by going down a tunnel near the exit to Sunset Hill. A great amount of Vivi clones will appear (18 in total). Fortunately, they only have 1 HP each, so one hit from the Keyblade will easily destroy them. While they may serve as a mild annoyance if they are somehow able to catch Roxas in a cooperative combo, no Potions should be necessary. The final wonder is on Sunset Hill. Head to the top and you will see three random dustbins and a large bag. Inspect the bag, and the mini-game will begin. The aim is to get the bag's stamina (shown as a bar to the top right) down to zero. This is done by performing reaction commands at the right time to jump over the strategically placed dustbins. If you have trouble dodging them, rapidly pressing throughout the entire event (no timing required) should suffice. After the final wonder has been completed, head back towards Sunset Hill, and a cutscene will be triggered, debunking rumor number six. Once you arrive back in Market Street, head towards the woods and through them to get to the Old Mansion. After some cutscenes, the day will end. Of note is that there are some treasures in Central Station: a Potion in the far southwest corner as you enter from the Station Plaza, another Potion in the far northeast corner of the station, and a Hi-Potion between the two trains. The opportunity to collect them isn't presented right away, but they of course can be collected at a later time. The last day begins with Roxas fighting yet more Dusks. After they have been beaten into oblivion, Axel will summon Assassin Nobodies. These are trickier then the normal Dusks, as they can disappear into the ground. Although you can see their fin, your attacks at them whilst in that state won't deal any damage. The exception to this is if Roxas attacks at the exact moment that they attack, resulting in a parry which should stun them and leave them open to combos, making them much more manageable. Otherwise, they will suddenly rise up below Roxas to deal six rapid attacks, dealing a great amount of damage. Parry or simply wait for them to rise out of the ground to defeat them, and after doing so, a mysterious voice will call Roxas to the Old Mansion. Make your way there whist fighting the plethora of Nobodies that attempt to stop your progress. The Dusks, Creepers, and Assassins will continue to slow down your progress. This is a good time to gain a couple of levels for the boss fight ahead, as there is a save point nearby. To the right of this room is a chest containing a Hi-Potion. Head to the back of this floor for a chest containing a Potion. Through the door to the left of the ground floor, the mansion's Dining Room can be found, containing more Dusks and Assassins as well as two chests: one containing an Elven Bandana which can be equipped for an extra boost in stats, and the other containing another Potion. Exit after collecting the items and dealing with the Nobodies, then head up the left flight of stairs. On the first landing is a chest containing yet another Potion. Head into the room to the left of the second floor to find the White Room, a space free of Nobodies that houses the aforementioned save point. After some cutscenes explaining Roxas' background, you'll receive Naminé's Sketches and the Mansion Map. Now, head towards the Library on the right-hand side of the second floor, and complete the sketch using the reaction command. Fight the enemies and pick up the Hi-Potion in the lone chest. Make sure to save, then head through the door. You will fight more Dusks and Assassins. After they're defeated, you'll have to fight a boss. This is the last battle before the prologue ends. As shown in the cutscene beforehand, Roxas obtains the ability to dual wield Keyblades (the powerful Oathkeeper and Oblivion in particular) for this battle. As soon as the battle begins, Axel will set the floor on fire. This has the obvious effect of draining your HP, so use Potions to keep it up if it gets low. Before starting the battle, equipping Champion Belt is recommended, as it reduces the amount of damage taken from Axel's attacks and the amount of health drained from simply standing on the floor. The majority of the combos done with the Keyblades will throw Axel into the air, which is a perfect time to pull off the Overtake/Clear Light combo. Although it doesn't cause any direct damage, it does cause the floor to return to normal, and for Axel to be stunned momentarily. Axel will occasionally exit the field through the flames (with no indication of where he is) and then leap back with an attack, at which case a reaction command can also be utilized for the same effect. If you have trouble catching him, simply lock onto him ( ). This should give Roxas an opening to guard or dodge and strike back with Burst Edge. However, with Roxas' powerful new weapons and quick combos, this battle should only serve to showcase the confused Keyblade wielder's latent power. Roxas will obtain a boost in his maximum HP for clearing the fight. After besting him, Axel disappears and leaves Roxas a bit confused. Go back and save your game if you wish, and then continue into the Basement Corridor. Here, you can find a Hi-Potion, as well as plenty of strange pods, two of which contain Donald and Goofy. Carry on to the Pod Room, where, after a conversation with DiZ, Roxas will disappear, and the game's title screen will finally present itself. This page was last edited on 22 September 2017, at 04:02. This page has been accessed 193,586 times.